Drone threats, the ongoing race to develop autonomous vehicles, and the effects of job concerns on national policies are all part of this week’s global robotics roundup. Systems and policies to address rising drone threats are becoming increasingly urgent, even as sporting events such as the Olympics take measures against unauthorized UAVs. In addition, this week, we look at self-driving cars as another area of international competition and how immigration restrictions could be affected by automation worries. Robotics Business Review has partnered with Abishur Prakash at Center for Innovating the Future to provide its members with cutting-edge insights into recent developments in international robotics, artificial intelligence, and unmanned systems. Are you ready to be updated? Sony Corp. has unveiled plans to launch a taxi-hailing service in Japan powered by artificial intelligence. The AI will be the foundation of the entire system, predicting demand and deploying taxicabs. Sony has partnered with six local taxi firms, including Green Cab and International Automobile, which have over 10,000 taxis at their disposal, which combined will be the largest taxi fleet in Tokyo. This development has a geopolitical undertone because of its timing. Last month, Alibaba Group Holding Ltd. signed a deal with Kuala Lumpur to use Alibaba’s AI to improve transportation in the Malaysian capital, including predicting traffic changes. It was the first time Alibaba had signed such a deal outside of China. Now, Sony has launched an AI-based transportation service in Japan. Is this the next area for AI competition between countries? Other companies working on autonomous taxis include Navya, Nvidia, and, of course, Uber (and Volvo). The global market will experience a compound annual growth rate of 81% from 2018 to 2023 in terms of vehicles deployed, predicts TrendForce. British telecommunications giant Vodafone Group PLC is testing software in Spain and Germany to defend against drone threats. The technology is intended to “track and control” malicious unmanned aerial vehicles (UAVs) that are too small for conventional radar to pick up. It will share this information with various authorities to stop planes from crashing into drones and to stop UAVs from carrying out terrorist attacks. Vodafone’s research and development are occurring as multinationals and governments ready for the rollout of EU-wide drone rules in 2019. These regulations are expected to significantly increase the use of drones in the continent. The security risks posed by UAVs are rapidly becoming apparent, after a collision with a helicopter in South Carolina. However, governments have been slow to respond to drone threats, with only one commercial drone pilot in the U.S. being warned for flying without a license. Particularly alarming was the footage purportedly taken by a drone from above an airplane landing at McCarran International Airport in Las Vegas. Moreover, the MIT Technology Review reported that UAVs could also be used for cyberwarfare, as smart homes and smart cities become vulnerable to remote hacking. Even as companies such as JD.com work with civil aviation authorities in China and elsewhere to get approval for drone deliveries, lawmakers could start looking to the skies nervously. In my book, Next Geopolitics: The Future of World Affairs (Technology) Volume One, I discuss drone threats and the potential for “technological terrorism.” For Vodafone and other organizations, the focus shouldn’t just be on identifying dangerous UAVs, but also on developing solutions to stop certain groups from using them in the first place. Although a handful of countries may be able to develop and deploy anti-drone measures, many won’t be able to do so. In these countries, the drone threats would persist. One solution is a drone registry, such as the one proposed by the United Nations, but building binding consensus is its own geopolitical challenge. Reactions to robots, AI, and self-driving cars are starting to influence politics, as seen in the U.S. Arkansas Senator Tim Cotton (R) has withheld his support from an immigration deal. Part of the reason, he said, was because of automation and employment concerns. “It can’t simultaneously be true that robots will take all the jobs and that the West needs millions of new immigrants to do the grunt work,” said Cotton. 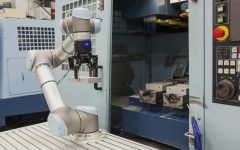 The ongoing debate over whether or not automation will replace jobs and what to do about the threat is moving from op-ed pages, business roundtables, and online forums to the political arena. As robots change the nature of work, taking on tasks in multiple industries, countries will need to plan accordingly. Will healthcare become cheaper or more expensive? How will immigration restrictions affect the use of automation in, say, farming — or vice versa? How can STEM programs and retraining prepare the workforce? And how will robotics and AI affect national security? As automation becomes part of our daily lives, societies should address these challenges head-on.